Popular family of bulb flowers in a massive array of colours which now includes newer double flowering hybrids such as the Nymph series and the new Blossom Peacock. Should be purchased with blooms showing some colour but still tightly clustered and not opening. This is a classic Christmas crop most widely available from Holland but also with great quality production from Ontario, Canada. 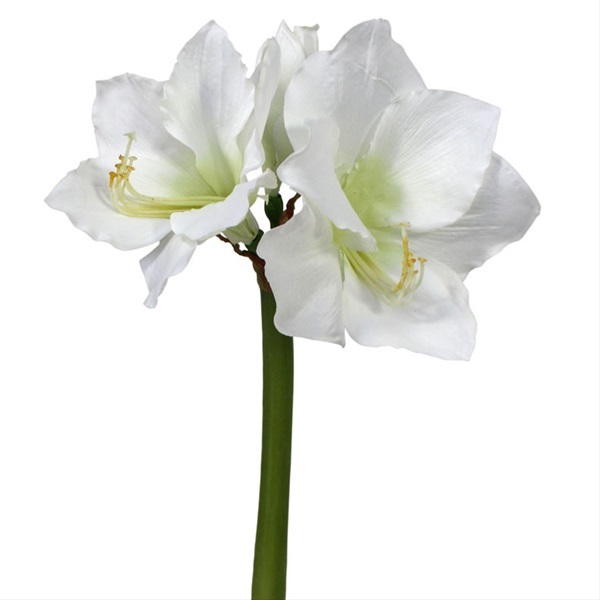 The Dutch production of Amaryllis runs from October until May with some supply even available outside of this season. Ontario production is available November / December. Cut stems and hydrate using floral preservative out of the cooler for 2 hours. Amaryllis stems can sometimes split while in a vase. This can be fixed by using transparent tape or an elastic. Split stems does not affect the blooms to drink properly. 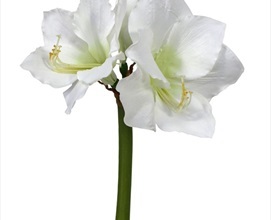 A tall vase is preferred to help support the heavy blooms of Amaryllis. Can last up to 10 days when recieved in proper tight bud stage. Usually 2,3 or 4+ blooms per stem. Stem lengths vary depending on variety from 45-85cm. Should be carefully packed using the well tested Dutch packing method in trays with some soft packing material to prevent marking. Amaryllis are very heavy and need to be shipped in "florist trays" to prevent shipping damage. Stems can split longitudinally in shipping and should be inspected on arrival for this problem. "Stem Splitting" and curling can be a problem after harvest once in the vase. It can be helpful to wrap the bottom of the stem with elastic or tape to prevent this. It should be noted that Amaryllis with slightly split and curling lower stems still drink and perform well. They can also simply be re-cut.